As I said last July, time sure flies when you're having supply chain fun. Here we are, more than halfway through 2015. It's been only six months, and I can hardly remember what happened in the supply chain earlier in the year, and I follow this stuff for a living. So, as always we'll do a 1H review now and then in January of course a retrospective of the year 2015 in supply chain, which readers have told me they appreciate. In April, Target stores announces it is jumping on the item-level RFID bandwagon, announcing an aggressive program that will have all its US stores RFID-enabled by the end of 2016. Inventory accuracy for store-based eFulfillment is key goal. So, here we go, starting with some main themes so far this year. Once again, the economies that underlie our supply chains have been lukewarm, which is obviously now the new normal. The latest revision to US real GDP showed a drop of 0.2% the first quarter, just as 2014 saw a decline of 2.9% in Q1. Things should be better in Q2, but in general we can probably expect full year real US GDP growth to be a little over 2% yet again. The IMF just downgraded its forecast for full year US growth to 2.5%, for example, down from 3.1% before. The unemployment rate is down, but so is the labor participation rate. Is there really a big deal between 2% and the 3% growth many see as needed? Yes there is, as a famous economist once noted, and the difference is 50%. The Euro zone saw weak growth again too, but at 1% positive it was better than the US. China's economy continues to wobble, and while it still says it will see 7% growth in 2015, that may be a real stretch. Slowing growth there is driving input costs way down. Manufacturing remained something of a bright spot, but may now be sputtering a bit. The US Purchasing Managers Index from the Institute for Supply Management has shown manufacturing growth (index above the 50 mark) for 30 consecutive months. It kicked off in January at a level of 53.5, the same score as just reported for June. But those were the two highest scores for the first half, as in general the levels in these first six months are 3-5 points lower than the last six months of 2014, meaning growth has been slowing. That positive but lukewarm state of manufacturing was evidence in US manufacturing output numbers as well. The index from the Federal Research at long last passed in July 2014 the 100 level that represents the peak and baseline year of 2007, meaning it took about seven years to come back from the start of the recession. But that score has remained virtually flat ever since, with a index of 101.3 in May (last data point we have), almost identical to the scores in all the other months this year. That means we are still just 1.3% above average 2007 levels, and have seen growth of just 1.8% year over year. Geopolitical tensions remained high (what else is new?) in many places, but didn't become "hot" in any of them. China is building fake islands to make territorial claims in the South China Sea, Russian troops are again massing on the border with Ukraine, ISIS is on the march, etc. This is just becoming the normal backdrop to supply chain planning and risk management. Will any of these situations get out of control? Certainly one of them someday, but which one? I would say the top theme in supply chain in the first six months of the year was the rapid rise of robot technology. This was in full evidence at the ProMat show in Chicago, where robots were doing some amazing things in case and piece picking, but almost daily there are stories about robotic advances in one area or the other - and often predictions of the perhaps scary impact this may have on human workers. China is adding robots by the tens of thousands even with pretty low labor costs. Rising wages was another key theme. Walmart announced big hikes in store associate wages in January, while Los Angeles and other cities increased the minimum wages substantially. This will eventually bleed over into manufacturing and especially distribution wages. After a multi-year saga, the US DOT says a second pilot program is a success, and Mexican trucking firms can now seek permits to operate in the US. Impact on US trucking is uncertain, however, due in part to issues with deadhead miles on return trips. Target stores says it is abandoning the Canadian market and closing all 133 of its stores there after disastrous two year effort plagued by many miscues, including several supply chain foul ups. With continued plunging oil prices, diesel costs reach a 5-year low of $2.87 per gallon, ultimately reaching a bottom of $2.78 in April. The US FAA at long last releases proposed rules for commercial drones that would be very restrictive and basically preclude drone package deliveries (e.g., drone must be in sight at all times, cannot fly over people). Amazon, others hope to change the draft rulest, look to Congress to overrule the FAA, as some say US will lose drone leadership. Procter & Gamble announces plans for new $50 million factory in West Virginia – just the second new US plant P&G will have opened since 1971. The new plant will be a sort of "factory of the future" - designed to run products across multiple product types and brands in a single facility. Walmart announces it will increase pay for store workers a few bucks an hour over the next several years, with a minimum of $10/hour in 2016. Says it will also improve scheduling practices. Move said to cost Walmart $1 billion in 2015 alone. Negotiations between West Coast dock workers and ports/terminals reaches low point early in month, with each side publicly calling the other a liar relative to alleged work slowdowns. Logjams and delays reach epic proportions, causing real supply chain issues, with many agricultural exports going to waste. Walmart announces new Sustainability Leaders program, in which its web site will display the Leaders logo for products it says pass it standards, created with the The Sustainability Consortium. Move will be a great test bed for how much consumers value sustainability. Deal at long last reached between West Coast dock workers and the ports/terminals, giving Longshoremen most of what they demanded, starting the end of the congestion/delay nightmare that will take until May to unwind. US import container volumes finally again reach highs seen in 2008, coming in at 1.8 million TEU for the month, up 22% from 2014, as huge trade deficit continues on. Prices for scrap materials such as plastics and paper in free all as global commodity prices continue to sink, with new and preferable PET plastic pellets lower priced than scrap, threatening recycling programs. 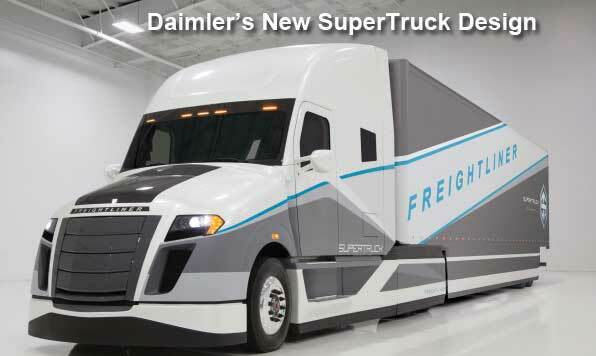 Another "Supertruck" under the EPA's program is unveiled, this time by Daimler Trucks and its US brand Freightliner, with claims the new design delivered freight efficiency improvement of a remarkable 115%, far above DOE's own goal of a gain of 50% from 2009 baseline, with a test showing mileage of an impressive 12.2 MPG. Some of the systems/materials are experimental, however. Union officials drop effort to organize workers at Boeing aircraft factor in South Carolina, in another setback for labor following devastating loss at Volkswagen plant in Tennessee the year before. After UPS was thwarted by Euro regulators, FedEx agrees to buy Dutch-based rival TNT Express. Gartner releases annual top 25 supply chain list, which puts Amazon.com on top after Apple and P&G are moved off of list to new "masters" category - sort of like a hall of fame. Amazon was followed by McDonald's, Unilever, Intel, and Identix (Zara) in the top 5. It's far from perfect, but it's the best we've got. Walmart announces its program to battle Amazon Prime for cheap shipping, with $50 annual fee getting free three-day shipping on all orders. Offer is by invitation only to start. Start up company CloudDDM unveils a 3D printing factory embedded in middle of UPS' worldwide hub in Louisville, Ky. It will soon have some 100 printers, with highly automated workflows that enable operations using just a handful of workers. UPS will handle fulfillment, and CloudDDM says approach will cut total cycle time dramatically to 24 hours. Target stores announces it is jumping on the item-level RFID bandwagon, announcing an aggressive program that will have all its US stores RFID-enabled by the end of 2016. Inventory accuracy for store-based eFulfillment is key goal. US DOT report mandated by Congress says there is not enough data to change rules on longer or heavier trucks, receiving much criticism from logistics industry. US House puts longer trucks (twin 33-foot trailers) in new Highway bill anyway, as well as continued suspension of 34-hour restart rule, but both must still be passed by Senate and signed by the president. Amazon holds its first "Robotic Picking Challenge," with 28 teams from around the world attempting machine picking of an odd array of items from static shelving. Winning team from Germany successfully picks 10 of 12 items - but takes 20 minutes. The annual State of Logistics from CSCMP finds logistics costs in 2014 fell to 8.3% of GDP in 2014 from 8.4% in 2013, but n oted a variety of cost pressures may turn that measure the other way in 2015. Amazon seeks new revenue source to offset shipping losses by gaining advertising revenue from special designed shipping carton promoting characters from the upcoming movie Minions. That as Amazon also announces a new program is called "Fulfillment by Amazon Small and Light," in which orders under eight ounces and $10 ship for free. Maersk Lines confirms rumors that it has placed an order for 11 new megaships capable of carrying 19,600 TEU, with options for six additional vessels from South Korea's Daewoo Shipbuilding, up from the 18,000 TEU capacity from 20 Triple E ships previously delivered by Daewoo. Los Angeles joins San Francisco, Seattle and others in passing law to raise minimum wage there to $15/hour over next few years. Amazon said to be mulling an Uber-like service in which drivers would find package delivery opportunities in urban from a mobile app, in a program Amazon is calling "On My Way." When Amazon might pilot such a program is unknown. What major trends or news stories in 1H 2015 did we miss? Let us know your thoughts at the Feedback section below.